Protein, carbohydrates (less than 1 calorie per dose), fats (saturated fats: .022 of 1%, polyunsaturated fats: .035 of 1%, monounsaturated fats: .032 of 1%) Vitamin C, Sodium, Potassium, Ash, Calcium, Iron, Sesqiterpene polyol esters. It is a shrub used in Ayurdevic medicine in India. This oil is a cold-pressed raw herbal oil expressed from the seeds of Celastrus panuculatis, a shrub native to India. While Celastrus oil has been used in India for centuries it is only within the past few years that it has started to become known outside of Ayurvedic medicine, the traditional medicinal practice of India. The oil is used to increase memory and facilitate learning. It induces a feeling of well-being and has reported aphrodisiac effects. The oil in its raw state has a shelf life of 2 years if kept in a cool and dark place such as a refrigerator. When put into softgels the shelf life can be expected to be much longer, on the order of four years if kept in a dark and refrigerated state. Celastrus paniculata is a treasured medicinal herb that is revered for its effects on the brain and has been used for centuries in Ayurveda for sharpening the memory, increasing intellect, and improving concentration. 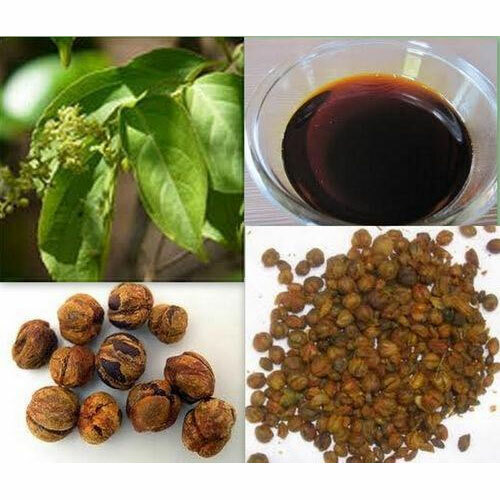 The seed oil is used for massage with great benefit, especially in vata diseases like sciatica, lumbago, paralysis, arthritis and facial palsy. The seed oil is useful to hasten the healing in non healing wounds and ulcers. The seed oil is extremely beneficial as a sirovirecana cleansing nasal therapy, wherein the drops instilled into nostrils, ward off mucous secretions in colds and cough. Solubility Practically insoluble in alcohol & water, soluble in oils.